One woman’s story of recovery through positive thinking is the theme of Linda Lendt's new book "Keep Your Chin Up"
Life can change in an instant. For Linda Lendt, it was a ten-second fall resulting in an injured spinal cord that took away her ability to walk and the independence she relied upon. Now wheelchair bound, she tells her story of how she embraced her new lifestyle with positive thinking and humor. “Keep Your Chin Up” is Lendt’s memoir where she reflects on her childhood and the blunders of her youth, and tells her journey of mentally and emotionally recovering from her traumatic incident. Through faith in the universe, she lives by the mantra that life is good. Lendt found that maintaining her humor and staying lighthearted gave her hope to survive and she wishes to provide the same encouragement to others. Through personal experience, she shares the message about living life to the fullest and the importance of seeing the positive in any situation. “‘Keep your chin up!’ is a powerful statement,” Lendt said. Her dad said these words on a few occasions and it forced her to look up from the tightening hurt of heartache to see all those around her who loved and cared about her. 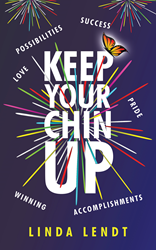 Linda Lendt originally wrote “Keep Your Chin Up” for her children as a keepsake and way for them to understand her and learn from her experience. She grew up on the countryside of northern Ontario as the youngest of seven children. This is Lendt’s first book.